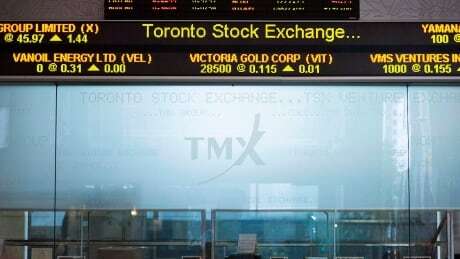 Canada's main stock index was trading up slightly in mid-morning as gold and cannabis stocks traded up, while U.S. markets were mixed as technology stocks traded lower. The S&P/TSX composite index was up 14.75 points at 15,429.04. The Canadian dollar traded up about a quarter of a cent at 77.04 cents US compared with an average of 76.7 cents US on Friday. Alfonso Esparza, an analyst for currency exchange and data company OANDA, said in an email to CBC that the loonie was boosted the by the release of the Bank of Canada business survey Monday. The report described the outlook for Canadian businesses as "robust." Esparza said that the Canadian dollar started the week on the right foot, but will face the release of September data from the Federal Open Market Committee. "The U.S. central bank hiked rates and is still expected by the market to do so again in December." In New York, the Dow Jones industrial average was up 10.06 points at 25,350.05. The S&P 500 index was down 2.92 points at 2,764.21, while the Nasdaq composite was down 27.59 points at 7,469.31. The November crude contract was down five cents at $71.29 US per barrel and the November natural gas contract was up nine cents at $3.25 US per mmBTU. The December gold contract was up $10.10 US at $1,232.10 an ounce and the December copper contract was up 2.6 cents at $2.83 US a pound.